Sensitivity Toothpaste for Daily Use, Sensitivity Toothpaste for Regular Use, Effective Toothpaste for Sensitivity, Best Toothpaste Doctors Recommend for Dental Sensitivity, Best Sensitivity Toothpaste, Toothpaste to Prevent Cavity, Toothpaste to Prevent Dental Caries, Best Toothpaste for Cavity, Toothpaste for Dental Caries, Desensitizing Toothpaste, Toothpaste to Prevent Caries, Anti-sensitivity Toothpaste, Anti-sensitivity Anti-cavity Toothpaste, Pain when Drinking Tea, Pain when Drinking Coffee, Pain while having Sweets, Safe Toothpaste for Patients with sensitivity, Best Sensitivity Toothpaste available in India, Medicated Toothpaste Manufactures in India, Toothpaste for Best Results, Toothpaste which dentist recommend, Best Toothpaste Manufactures ,Sensitivity Toothpaste prevents dental caries, Sensitivity Toothpaste for Best Result, Toothpaste which Prevent Dental Diseases, Long Lasting Protection from Sensitivity, Solutions for Dental Caries (Cavities),Solution for Sensitivity, Pain when Drinking Cold Water, Sensitive Toothpaste, Best Toothpaste for Sensitive Teeth, Best Sensitive Toothpaste, Fluoride Toothpaste, Anti-cavity & Anti-sensitivity Toothpaste in Bangalore, India, Toothpaste Recommended by Dentist for Sensitivity, Toothpaste Prescribed by Dentist for Sensitivity, Solution for Sensitivity, Toothpaste to Remineralize Enamel, Toothpaste to Remineralize Teeth, Best Sensitivity Toothpaste in India, Solution for Sensitive Teeth, Pain when Drinking Cold Drinks, Pain when Drinking Hot Drinks, Anti-cavity Toothpaste, Toothpaste for Strong Teeth, Toothpaste Manufacturing Companies in India, Toothpaste Manufacturing Companies in Bangalore, Best Toothpaste Manufacturing Companies in India, Best Toothpaste Manufacturers in India, Toothpaste Manufacturers in Bangalore, Toothpaste which prevent Caries, Best Toothpaste manufacturing company in India, Medicated Toothpaste Exporters from India, Best Toothpaste for Dental Hygiene, Relief from Sensitivity, Toothpaste to prevent tooth decay, Strengthen and Protect your teeth., Maximum Protection from Tooth Decay & Sensitivity, Anti-Sensitivity Toothpaste, Sensitive Toothpaste, Best Toothpaste for Sensitive Teeth, Toothpaste for Sensitive Teeth, Best Sensitive Toothpaste, Best Toothpaste Doctors Recommend for Dental Sensitivity, Best Toothpaste Recommended by Dentist in India, Best Toothpaste for Sensitive Teeth and Gums, Best Toothpaste for Sensitive Teeth in India, No 1 Toothpaste for Sensitive Teeth in India, Top 10 Toothpastes for Sensitive Teeth, Anti Cavity Toothpaste, Best Toothpaste in India for Cavity, Best Toothpaste for Tooth Pain, Best Toothpaste for Cavities, Best Toothpaste to Prevent Cavities in India, Toothpaste to Prevent Tooth Decay, Best Toothpaste for Cavity Prone Teeth, Best Toothpaste for Cavity Prevention, Best Toothpaste for Tooth Pain in India. Sensitivity Toothpaste for Daily Use, Sensitivity Toothpaste for Regular Use, Effective Toothpaste for Sensitivity, Best Toothpaste Doctors Recommend for Dental Sensitivity, Best Sensitivity Toothpaste, Toothpaste to Prevent Cavity, Best Toothpaste manufacturing company in India, Medicated Toothpaste Exporters from India, Best Toothpaste for Dental Hygiene, Toothpaste to Prevent Dental Caries, Best Toothpaste for Cavity, Toothpaste for Dental Caries, Desensitizing Toothpaste, Toothpaste to Prevent Caries, Long Lasting Protection from Sensitivity, Solutions for Dental Caries (Cavities),Solution for Sensitivity, Pain when Drinking Cold Water, Toothpaste Recommended by Dentist for Sensitivity, Toothpaste Prescribed by Dentist for Sensitivity, Solution for Sensitivity, Toothpaste to Remineralize Enamel, Toothpaste to Remineralize Teeth, Best Sensitivity Toothpaste in India, Solution for Sensitive Teeth, Pain when Drinking Cold Drinks, Anti-cavity & Anti-sensitivity Toothpaste in Bangalore, India, Pain when Drinking Hot Drinks, Anti-cavity Toothpaste, Anti-sensitivity Toothpaste, Anti-sensitivity Anti-cavity Toothpaste, Pain when Drinking Tea, Pain when Drinking Coffee, Pain while having Sweets, Safe Toothpaste for Patients with sensitivity, Best Sensitivity Toothpaste available in India, Medicated Toothpaste Manufactures in India, Toothpaste for Best Results, Toothpaste which dentist recommend, Best Toothpaste Manufactures ,Sensitivity Toothpaste prevents dental caries, Sensitivity Toothpaste for Best Result, Toothpaste which Prevent Dental Diseases, Toothpaste for Strong Teeth, Toothpaste Manufacturing Companies in India, Toothpaste Manufacturing Companies in Bangalore, Best Toothpaste Manufacturing Companies in India, Best Toothpaste Manufacturers in India, Toothpaste Manufacturers in Bangalore, Toothpaste which prevent Caries, Sensitive Toothpaste, Best Toothpaste for Sensitive Teeth, Best Sensitive Toothpaste, Fluoride Toothpaste, Relief from Sensitivity, Toothpaste to prevent tooth decay, Strengthen and Protect your teeth., Maximum Protection from Tooth Decay & Sensitivity, Anti-Sensitivity Toothpaste, Sensitive Toothpaste, Best Toothpaste for Sensitive Teeth, Toothpaste for Sensitive Teeth, Best Sensitive Toothpaste, Best Toothpaste Doctors Recommend for Dental Sensitivity, Best Toothpaste Recommended by Dentist in India, Best Toothpaste for Sensitive Teeth and Gums, Best Toothpaste for Sensitive Teeth in India, No 1 Toothpaste for Sensitive Teeth in India, Top 10 Toothpastes for Sensitive Teeth, Anti Cavity Toothpaste, Best Toothpaste in India for Cavity, Best Toothpaste for Tooth Pain, Best Toothpaste for Cavities, Best Toothpaste to Prevent Cavities in India, Toothpaste to Prevent Tooth Decay, Best Toothpaste for Cavity Prone Teeth, Best Toothpaste for Cavity Prevention, Best Toothpaste for Tooth Pain in India. Elsenz comprises fluoro calcium phosphosilicate which is an improved form of bioactive glass. Elsenz forms acid resistant fluorapatite and releases fluoride over a period of 8 – 12 hours. This combined action of apatite formation and ion release makes Elsenz a unique toothpaste to use for remineralization and treating teeth sensitivity. Elsenz has fluoride containing bioactive glass. The addition of fluoride into bioactive glass provides several advantages. Elsenz dissolves in the mouth releasing calcium, phosphate and fluoride ions and forms fluorapatite which is more resistant to acid attack than hydroxyapatite and hydroxycarbonate apatite. Incorporating fluoride into the glass also speeds up the apatite formation process. For these reasons, fluoride is incorporated into bioactive glasses. Elsenz contains almost three times high phosphate than that of conventional bioactive glass. High phosphate in bioactive glass forms apatite faster which helps relieve sensitivity quicker than currently available bioactive glasses and forms fluorapatite rather than fluorite with the minimal possible rise in pH. 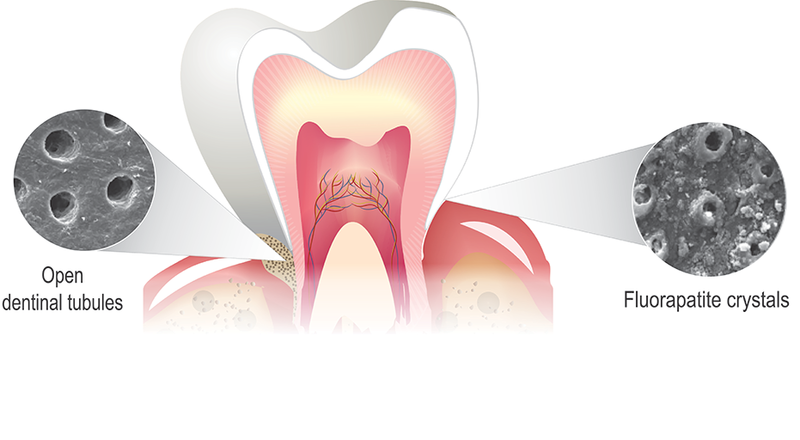 The particles of Elsenz are designed to be small enough to enter the dentinal tubules where they convert to either fluorapatite or apatite mimicking the natural biological mineralization process of enamel. The smaller particle size also reduces abrasivity of toothpaste which results in lesser enamel wear. Elsenz is designed to dissolve faster under acidic conditions offering added protection when teeth are directly challenged with acidic food or beverages. Elsenz dissolves quickly, raising the pH and releasing calcium, phosphate and appropriate quantity of fluoride ions to minimize the acid dissolution of the apatite crystals.